We all work hard and need a time-out don’t you think? So why not feel like royalty when you step into your bathroom before heading back to the known reality? There are too many things you can do and a wide variety of materials, colours, designs, and styles you can choose from! Your master bathroom should help you to escape from the world you know just for a while. Here are some thoughts on how to fashion a glamorous bathroom. If you are longing for that majestic touch use neutral colours as your dominant colour and add gold or rose gold accessories and/or even sanitary ware. White marble flooring will create a clean, polished appearance or if you are leaning towards a warmer atmosphere then cherry wood flooring will improve the classy, elegant feel. Use large, antique mirrors to add to the glamour factor. An antique brass finish could complement the sophistication of the room. 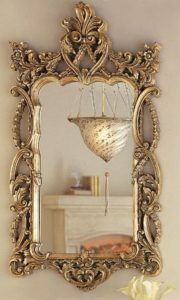 Mirrors will enhance the lighting in the room and create the illusion of space. 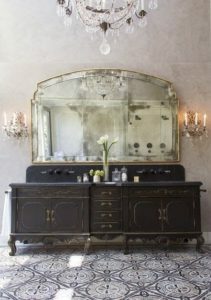 Placing a large, antique vanity in your bathroom will improve warmth and contrast and may potentially become the focal point. Your bathtub is the main element of course, where most of your time is spent. A beautiful free-standing Victorian bath placed in the centre of the bathroom can only develop your look further. Most of us can only dream of having a fireplace in our bathroom, it does, however, boost the warmth in a room. The crackling sounds and the warm glow just oozes a calming aura. A chandelier will instantly grab ones’ attention and create a whole new glamorous and luxurious factor to your bathroom. A chandelier is perfect if you desire a glittering world. Changing a few things in your bathroom such as the knobs on your vanity to crystal knobs can change the entire style of your bathroom!